To Order: Select Add to Cart and proceed to Cart to checkout on top right of page. You never have to create an account to buy from SilverFire! 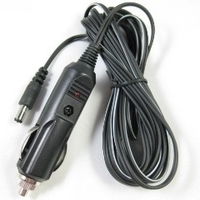 Super Dragon 12 Volt Cigarette Lighter Adaptor & Cord. This handy cigarette lighter adaptor is perfect for field use using your vehicle or a battery pack to power your Super Dragon fan. The 12 Volt adaptor comes with a 13 foot power cord. Please call for shipping quote to Alaska, Hawaii, & Puerto Rico for additional USPS shipping fee total. Please call or write for all International shipping quotes.